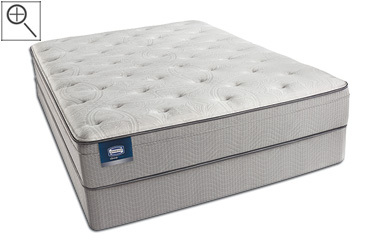 The Rome Plush Euro Top by Simmons BeautySleep is one of the more built-up BeautySleep models available, featuring; AirCool Foam, AirFeel Foam, Energy Foam and a 700 Series Wrapped Coil unit. The Euro Top is an attached Pillow Top with two layers of soft foam inside, offering you a cushiony sleep option that still has a reasonably durable coil system. This plush sleep option has a high density edge which all-but eliminates the bouncing and swaying feel that motion creates in lesser mattresses. This model is aggressively priced to match the quality of competing models, at a slightly lower cost.